When one puts his or her best foot forward, it’s an indication he or she is embarking on a journey, or undertaking a task, with purpose and enthusiasm. For a ninth year, the Bears’ Lair Entrepreneurial Competition will celebrate those who have done just and now want to take their business venture to the next level. On Tuesday (January 22) in the lobby of VentureNorth in downtown Peterborough, details of the annual competition for cash prizes were revealed by Catia Skinner, chair of the Bears’ Lair steering committee. Application Deadline – Tuesday, February 26, 11:59 p.m.
She also formally announced the opening of the application process that will lead to six finalists pitching their business, and their vision and plan for its growth, before a panel of judges on Tuesday, April 30, 2019 at The Venue. “It’s a great way to highlight our entrepreneurial focus and that Peterborough and the Kawarthas is a great place to start a business and to grow a business,” said Skinner, the owner and of Mega Experience marketing agency who has been on the committee for three years but is serving as its chair for the first time. Applications for the Bears’ Lair Entrepreneurial Competition are available online at www.bearslairptbo.ca and are due Tuesday, February 26th by 11:59 p.m.
For those on the fence about applying, an orientation session planned for 5 p.m. on Tuesday, January 29th at VentureNorth will provide more information. As the first step in the application process, each applicant is required to post a photograph to the Bears’ Lair Facebook page that represents their business. Also required is a business plan, due February 26th, that outlines the next steps for the business. To be eligible for the competition, entrepreneurs must have a registered business — incorporated, sole proprietor, or partnership — with annual sales under $200,000 and be able to undertake the ‘pitched’ work within the next 12 months. Startup or pre-sales businesses must exhibit a meaningful investment of time, equipment, money or research and development while existing businesses must show a significant move towards a new product, service or market, or the commercialization of intellectual property. On Tuesday, March 12th, the competition’s semi-finalists will be announced, each of whom will be showcased at a public event on Tuesday, March 26th at The Venue. That’s the precursor to the big event that will see the finalists judged in two category streams: Goods and Services (for businesses creating and selling products or delivering a type of service) and Innovation (for businesses focused on technology, innovation and ideas, such as a new program or process). Each presentation will be scored based on innovation, commercialization, diversification, business plan quality, and the benefits to the local economy. Up for grabs, besides the ultimate in bragging rights, is a total cash pay-out of $20,000, with each of the winners in the two category streams receiving $8,000 with the runners-up receiving $1,000 each. This is a departure from past competitions which saw gifts-in-kind make up part of the prize package. “It (cash) is really what they need at this stage of their business … we really encourage sponsorship because that’s how we’re going to raise the money,” said Skinner, noting those interested in sponsoring can contact her at catia@megaexperience.ca or 705-243-6989. 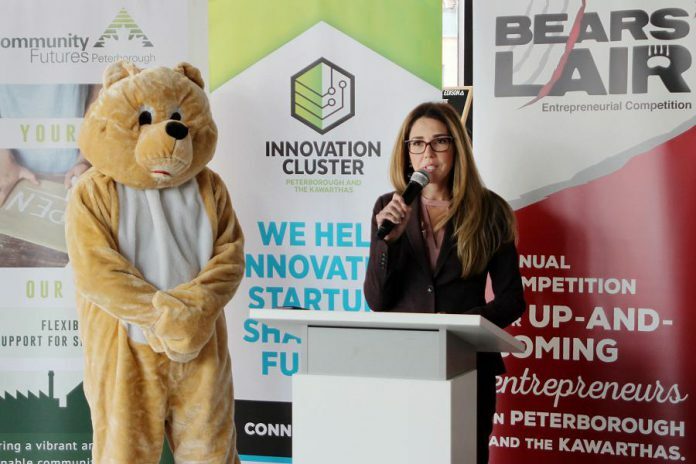 Presenting sponsors the 2019 Bears’ Lair Entrepreneurial Competition are Community Futures Peterborough, Innovation Cluster, Peterborough Region Angel Network, Peterborough and the Kawarthas Economic Development, and Mega Experience. In addition, kawarthaNOW.com is the media sponsor. “Similarly how people say it takes a village to raise a child, it takes a community to build entrepreneurs,” said Rhonda Keenan, president and CEO of Peterborough and the Kawarthas Economic Development. 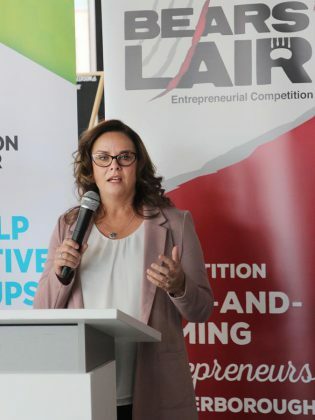 For more information on the 2019 Bears’ Lair Entrepreneurial Competition and to get started on your application, visit www.bearslairptbo.ca.